FINALLY, I have some exciting news to share here on Lose it Lyss…I got a job! After nearly 4 months of being unemployed, ya girl is finally re-entering the working world, whoohoo!! While everything is going super great so far (I’ll spare you the details for now), my work days feel dramatically longer than my previous position due to a long commute. It now takes me anywhere between 1.5–2hrs to get to and from work (roundtrip is 3 hours), so I’ve definitely been experiencing trouble when it comes to preparing healthy meals. That’s where these overnight oats come in. Meal prepping oats have become somewhat of a saving grace for me, and while my last recipe has been a hit in the “Lose It” household, it’s time to break up the monotony. 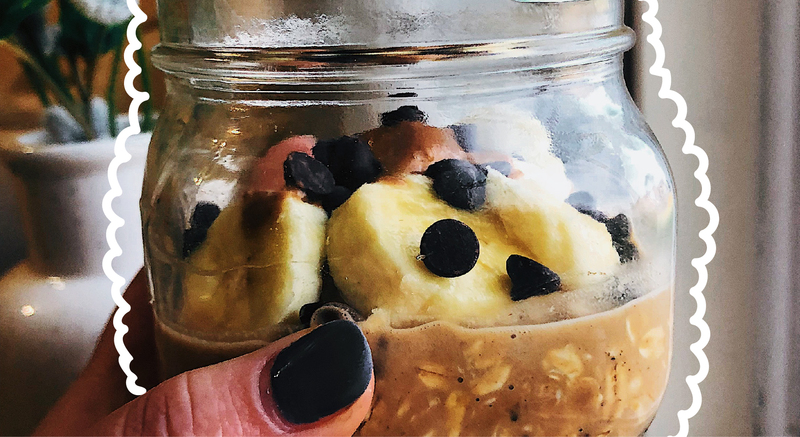 Therefore, in honor of the new changes in my professional life, and the much needed ones on my breakfast menu, I bring you this hefty jar of chocolate peanut butter banana overnight oats! Following the instructions on the packaging, mix together the PB2 powder & water in a small bowl to make the chocolate peanut butter. Set aside. In a mason jar or small container, add in the oats, almond milk and sweetener. Mix all ingredients well. Add in the banana (sliced into circles), chocolate chips and peanut butter. Mix everything together & garnish if desired. Place in refrigerator overnight and enjoy the next day, hot or cold! I hope you enjoy this simple breakfast, and it helps you power through your busy mornings :). As always, thank you for stopping by and have a happy and healthy rest of your day! You’re too kind, thank you so much! Me too 😋 Let me know what you think if you do! !